I love tassels. Lamp tassels, ceiling fan tassels, tassels on graduation caps, horse and camel tassels, beaded tassels…you name it. I also love beads. I must have been a magpie in a previous life because anything shiny, sparkly and round makes me giddy and causes my knees to go weak. So imagine my delight when I came across some online pictures of silky tassels adorned with seed beads! I felt I had died and gone to tassel-bead heaven. I knew I had to have some. At a price of $30 dollars per tassel however, it would have meant spending hundreds of dollars to buy all the tassels I saw in the pictures. And of course I wanted them ALL. The more I looked at them and drooled, the more I realized that I could make them myself and bead them any way I wanted to. Not to mention having fun in the process. I love it when I find a new project to keep me busy. (So does my family) And I had everything I needed right at home. 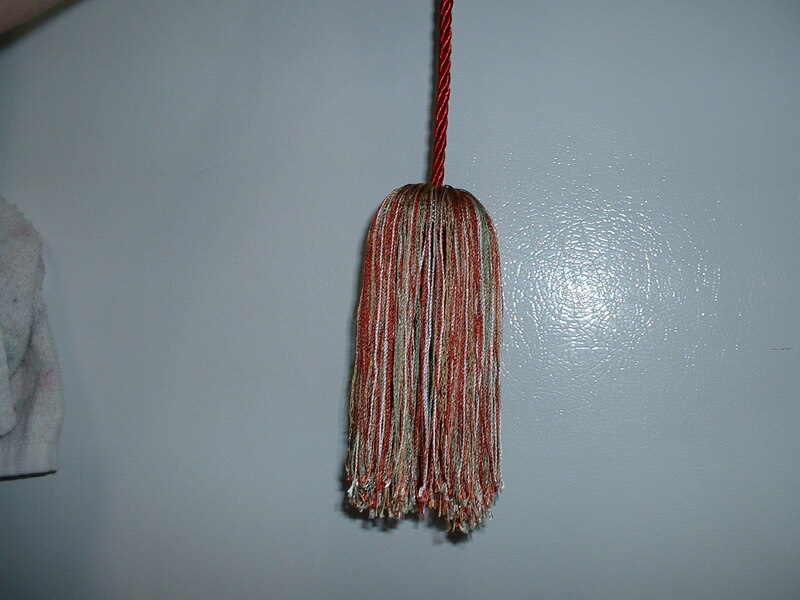 Granted, there are many different ways to make tassels. Everyone has their preferred method. I used the fringe method because as luck would have it, I had about 70 yards of thin chainette fringe that I had bought several years ago (don’t ask me why) in about six different colors so I figured now was as good a time as any to take those fringes out of their plastic wrappers and put them to use. To make the tassel itself, you only need three things. 1. 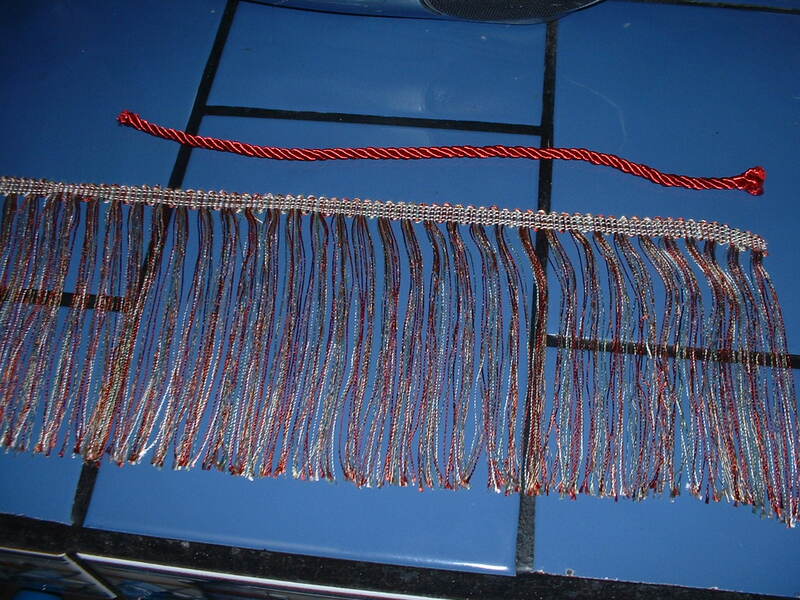 A length of fringe 2. a pretty cord 3. a hot glue gun. I began by cutting a length of cord about 10 inches long. 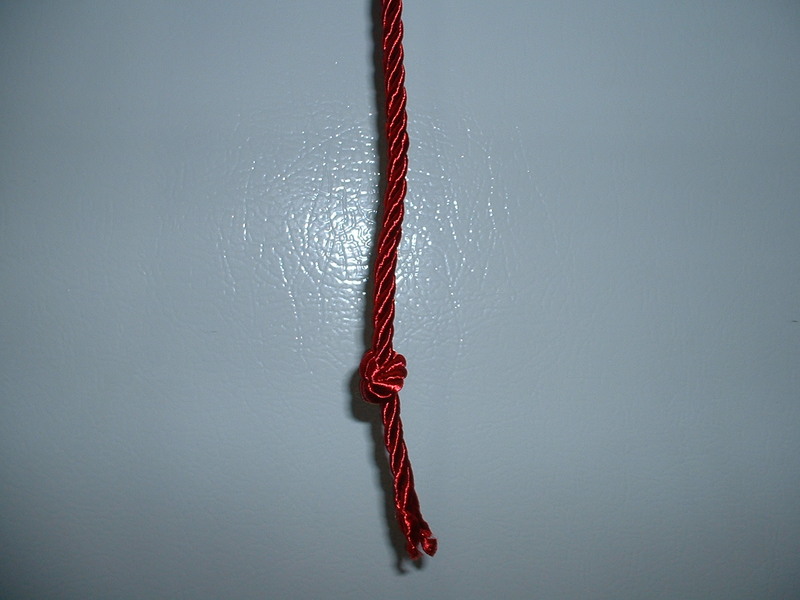 The length of the cord will depend on the length that you want the tassel cord to be. Then I tied a very tight knot towards the bottom of the cord. I dabbed a bit of hot glue on the knot to make sure that it could not come untied. Next, I began to wrap the fringe around the long end of the knotted cord hot glueing as I wrapped right underneath the knot. Just small dabs of hot glue as you work the fringe around the cord will be enough to hold the fringe in place. It’s important to wrap it evenly one layer over the other. The more fringe you use, the fatter the tassel will be, the less fringe…the thinner it will be. The next thing I did was to flip everything over upside down and grab it from the long end. Now I had something that looked very much like Cousin It. I smoothed out the threads on the top and made sure there were no stray or out of place threads. Now the short end of the cord was hidden inside of Cousin It. Then I took a strand of the same fringe (you can use thread or yarn as well) and tied it very tightly around the outside to form a sort of “neck” right below knot that was now hidden inside of the fringe. I now had something that looked like cross between a tassel and a Halloween goblin. I then trimmed the bottom of the tassel with a scissors so that it would be perfectly even. Now came the fun part. The decorating. 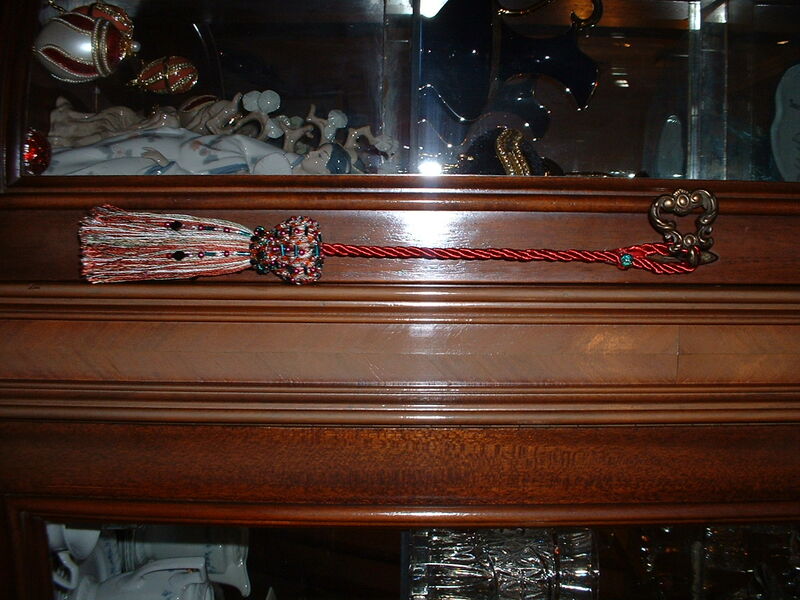 I pulled out my boxes (and boxes) of beads and began to sew them onto the tassel with a needle and thread. I used a beading needle for attatching seed beads and a regular sewing needle for the bugle beads and the larger beads. 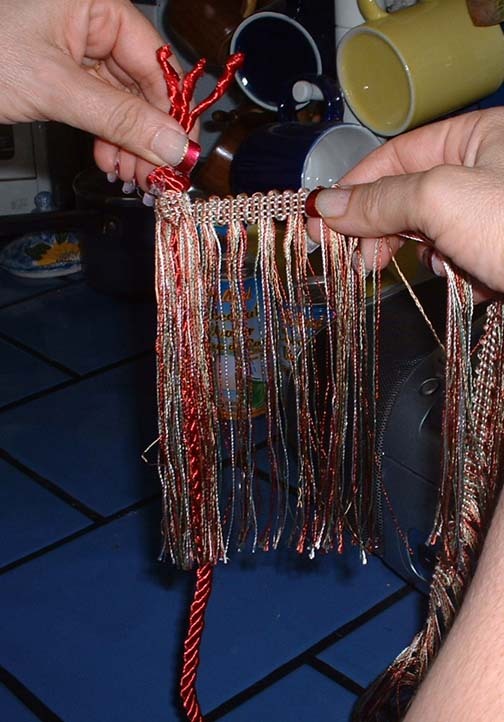 I began the beading by sewing several overlapping layers of beads around the “neck” of the tassel. The heavier the beading, the richer the tassel will look. Beads don’t all have to be the same color and size either. 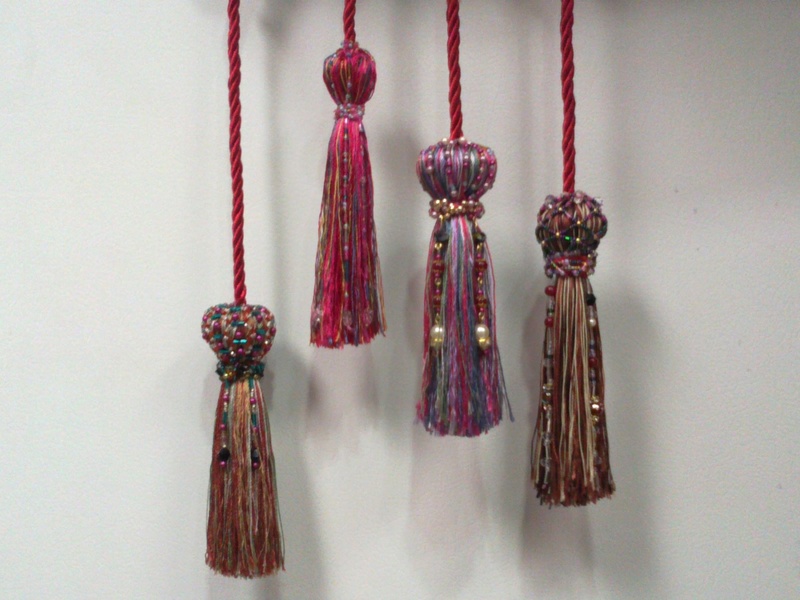 They can be of varying sizes and textures and colors, all on the same tassel. That’s what gives visual interest. Once the neck was beaded, I began to work upwards to the round part, beading randomly towards the cord. The final step was to hang long strands of beads from the neck so that they would glimmer and shine among the threads of the fringe. I attatched some of the bead strands with needle and thread, passing the needle back up over the last bead on the strand and knotting it right above the bead. 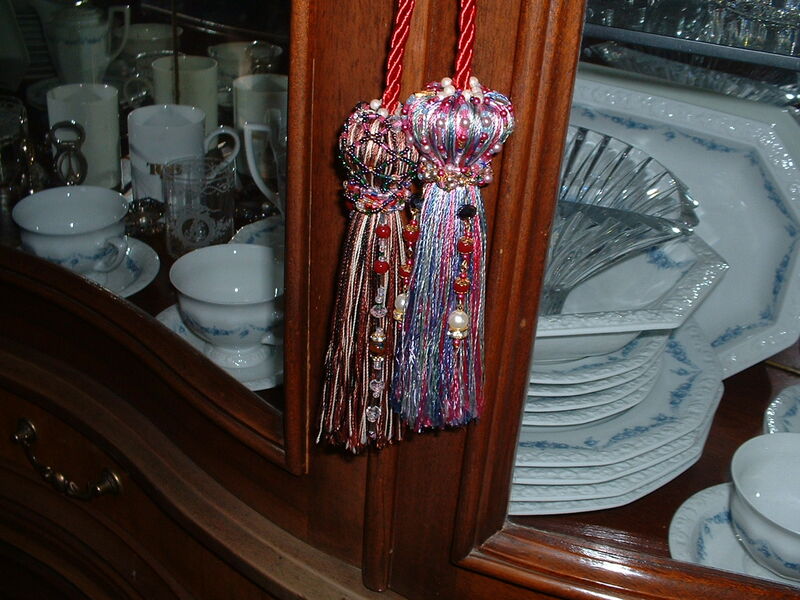 On other tassels I used gold plated eye pins and a rosary plyers to hang the bead strands. The gold eye hooks gave them extra glimmer. 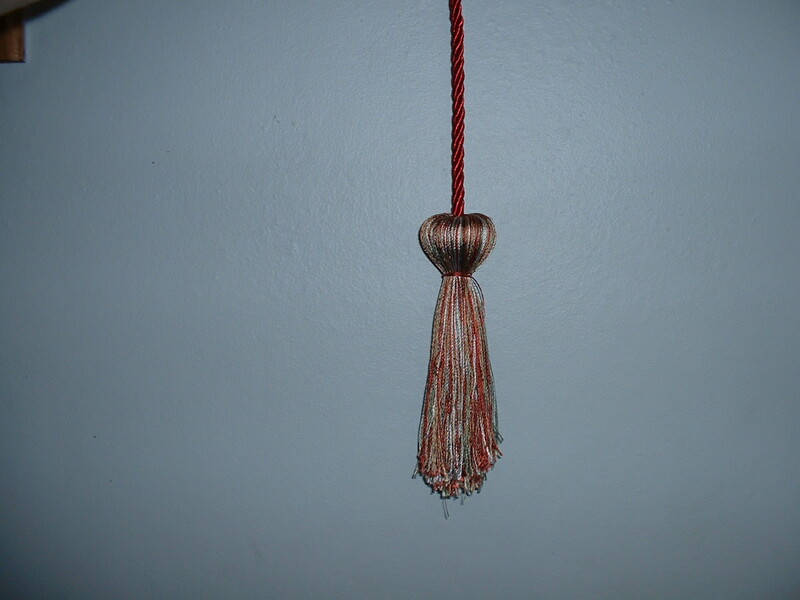 Lastly, I made a loop at the end of the cord and hot glued it into place, so that the tassel could be hung and I added a bead to the loop. 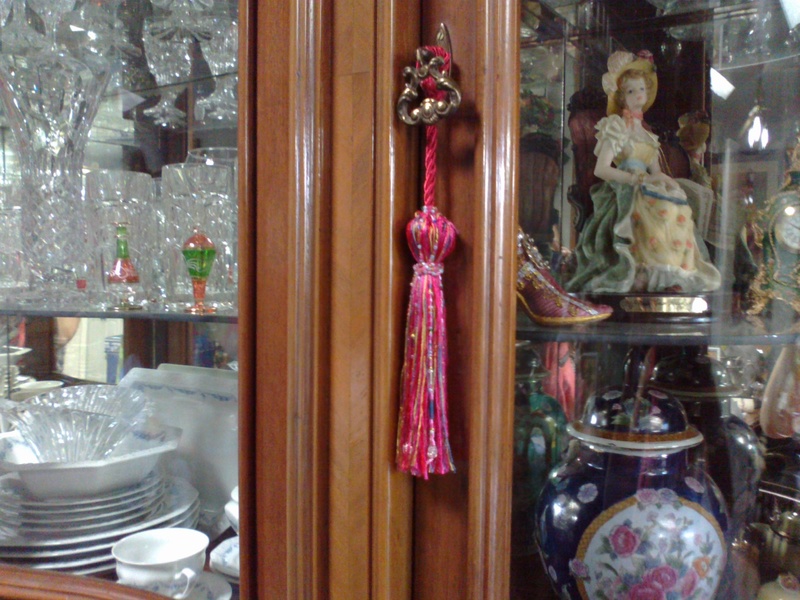 Now, if I could only find enough places to hang all these tassels from. Hmmm….I’m thinking they might look good on the Christmas tree next year…..
Bello! Simple y Bello, Mashallah, amiga! Ya me pican las manos para hacer algo parecido!!! They look like beautiful little dolls! Amazing work as usual!